Canned string beans and frozen strawberries, or fresh butternut squash and ripe persimmons? The choice is yours – you can shop at chain grocery stores, or you can support farmers directly by buying local produce at farmers’ markets, or through community supported agriculture (CSA) boxes. 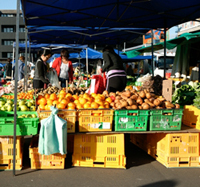 At farmers’ markets, you can stroll along, browsing the stalls of local farmers and merchants. Although each market has different specifications, generally farmers’ markets provide organic produce grown by farmers within a 50-mile radius. The proximity of the farms to the markets allows farmers to pick the produce at peak ripeness and sell it immediately to the consumer. Usually, farmers have to pick unripe produce so that it can sustain the long voyage from farm to grocery store shelves without rotting. Vine- or tree-ripened fruits have much fuller flavors than fruits ripened by chemicals or in storage containers. Buying from local farms also means that you are only buying in-season produce, which can be grown locally. Unseasonal produce must be shipped from places with different climates, or from the opposite hemisphere. The shorter distance that local, in-season produce must travel also uses less fossil fuels, decreasing your carbon footprint! Farmers’ markets also allow farmers to sell a wider variety of produce to the consumer at a higher profit margin. Traditional corporate grocery stores sell the same types of produce to consumers year-round, regardless of what is in season. They also act as middle-men, taking a large portion of profit from the farmers. At farmers’ markets, farmers have the power to choose which produce to offer to the consumer, and receive the full profit from the sales. As a result, farmers can afford to grow and sell a much wider variety of fresh, in-season produce for your enjoyment. Visit Local Harvest: Farmer’s Markets* to find your nearest farmers’ market. Many farmers’ markets are also reaching out to families who are eligible for the Supplemental Nutritional Assistance Program (SNAP) in order to provide greatly-needed access to healthy, fresh foods in low-income neighborhoods. Programs in the San Francisco Bay Area and in Michigan offer extra money towards food for every SNAP dollar spent at a farmers’ market. Similar programs have been introduced at 60 farmers’ markets in 12 states, and the number of farmers’ markets accepting SNAP funds in steadily increasing. Pending legislation would offer a 50% discount to SNAP recipients who purchase fresh produce. If you don’t have a local farmers’ market, or if you don’t have time to travel to the farmers’ market every week, consider getting a CSA box. CSAs represent a partnership between consumer and producer. 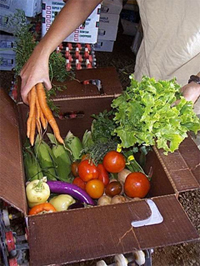 Consumers invest in the farm in the form of seasonal or monthly payments, and reap the farm’s harvest in return, receiving weekly or biweekly boxes of produce. It’s similar to the stock market, with people buying shares in a company and receiving dividend payments. Some CSAs require you to invest in an entire season’s worth of produce, paying the money upfront at the beginning of the growing season, while others allow you to pay for boxes monthly. Just like when you buy stock in a company, you are sharing both the successes and failures. If a crop is unsuccessful, subscribers will not receive that type of produce. However, there are huge benefits of CSAs for both farmers and subscribers. Having a guaranteed consumer base at the start of the growing season allows farmers to focus their efforts on their crops, rather than on marketing and sales. By investing in the farm as a whole, rather than paying for a particular type of produce, subscribers also allow farmers to grow a healthy variety of crops. Government subsidies of corn and soy crops, and the narrow range of vegetables sold in traditional grocery stores encourage monoculture. Growing only a few types of crops is very detrimental for the environment; it causes more soil erosion and makes crops more susceptible to insects and disease. CSAs counteract this by guaranteeing farmers a market for a wide variety of produce. Farmers can decide which crops to grow based on the needs and capabilities of the farm as a whole, rather than being subjected to the demands of the market. Consequently, CSAs provide consumers with a wonderful variety of in-season produce. You get to try new fruits and vegetables, while knowing that you are directly connected to the land on which your food is grown. Many CSAs also include recipes, in case you’re not familiar with the best ways to prepare okra or rutabagas. Plus, many farms will deliver the produce directly to your door! To find CSAs near you and to view the different subscription types and produce offered, browse Local Harvest: CSA*. Farmers’ markets and CSAs not only allow you to help the environment by purchasing local, organic, fresh, in-season produce, they also encourage a thoughtful relationship with food, and make adopting a vegan lifestyle easier. Farmers are no longer faceless laborers; they are the people whose farms you are invested in, the people you chat with every week. Rather than a giant corporate chain of profit margins, food once again becomes a gift from the earth.